Crafted of quality linen and cotton, this stylish tunic is designed by Tae Thongsri. 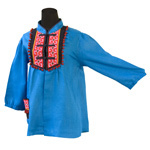 It features a mandarin collar, button knots and long sleeves. 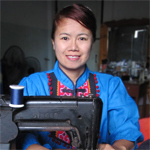 The chest is adorned with pompoms and geometric motifs embroidered by Yao artisans - the Yao are one of the ethnic minority groups of Southeast Asia. 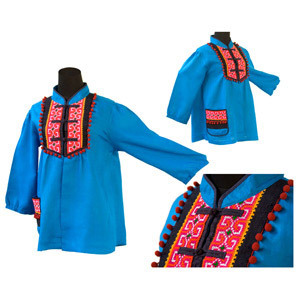 The ethnic motifs are repeated on the pocket. Materials: 85% linen and 15% cotton.